Some of Cathedral City's tickets can possibly be ignored. If your "ticket" does not have the Superior Court's name and address on it, it is what I call a "Snitch Ticket." For more details, see the Snitch Ticket section on the Your Ticket page. If your Cathedral City ticket is a real one (not a Snitch Ticket), be sure to contact me. 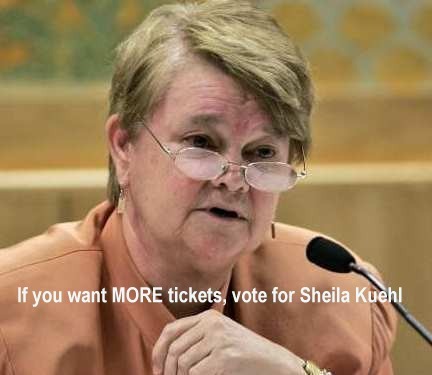 We need to watch Kuehl carefully, because as a Supervisor she will have a seat on the MTA/Metro board and she will be a vote to continue and expand their huge (101 cameras, so far) red light camera system. In 2016 she voted to put Measure M, a new countywide sales tax, on the Nov. 2016 ballot - and it passed. Most of the money will go to Metro. Kuehl will be up for re-election in 2018 and Nov. 2022. These totals were provided by the City. These totals, annual totals, and annual projections, are by highwayrobbery.net. The projection for 2018 is based upon Jan. - May only. Any figures in red type (or, if you are looking at this table in black and white, the upper figure when there are two or more figures in a cell) are what ATS calls Violation Events, or all incidents recorded by the cameras, and due to time limitations may have been posted here only for selected months or locations. If there is sufficient public interest, the remaining months will be posted. The figures in black type are what ATS calls Citations Issued, and may represent the sum of genuine citations issued (those filed with the court) plus any Nominations mailed (not filed with the court, a.k.a. Snitch Tickets). New camera as of this month. Ticketing doubled between Dec. 2013 and Jan. 2014, and jumped again in Feb. 2016. Also see Set # 4, below. Cathedral City, CA (January 27th, 2009) – The City of Cathedral City has issued more than 534 citations to red-light runners in 2008 thanks to Cathedral City’s red light photo-enforcement program. Local and National trends show that the number of violations occurring at photo-enforced intersections decreases the longer a camera-enforced intersection has been active. There has been a 50% decrease in the number of citations issued since 2007, as well as a 30% decrease in the number of reported traffic collisions in the affected area. Cameras operate 24-hours a day and capture images of every vehicle entering an intersection after the traffic signal is already red. The program vendor, American Traffic Solutions, then sends the images and video of each potential violation to Cathedral City Police Department, who then reviews the potential violations and decides if a citation should be mailed to the vehicle owner. The first camera went active in Cathedral City in January 2006. There have been two additional camera systems installed in January 2009. Early 2013 invoices show the City was paying $4990 per camera, each month. Late 2013 invoices show the City still was paying $4990 per camera. On May 14, 2014 the city council voted 4 - 1 (Toles: nay) to extend the program for three more years. The new contract reduced the rent to $3500 per camera - still too high, see FAQ # 17 - and allows cancellation so long as the City gives 60 days notice. A discussion of the cameras was on the agenda for a June 10, 2015 study session. The staff report revealed that 69% of the tickets go to visitors. On May 16, 2017 the chief of police approved a one year extension of the contract, to June 2, 2018. At their Apr. 25 meeting the City Council voted 4 - 1 (nay: Pettis) to allow the contract to expire on June 2, 2018. CVC 21455.5(c)(1) and CVC 21455.5(c)(2)(f) require a City to have controls and guidelines for the issuance of tickets, and most cities have put theirs in writing. In Feb. 2015 highwayrobbery.net sent Cathedral City a Public Records Act request asking for the items in blue, below, and in May got the answers in red, indicating that the City has no written procedures - it's all in their heads! Perhaps that is why the City experiences sudden changes in ticketing, like the New Years doubling between Dec. 2013 and Jan. 2014. P. The latest version or revision of the City's and/or sheriff's written controls or guidelines, as required by CVC 21455.5(c)(2)(F). "There is no requirement for “written” controls under this section. The controls are that Sworn Police Officers are the only personnel who can access the system and issue citations based on their training and experience. Those citations approved by the officers are then processed by ATS and sent to the violators in the legally prescribed manner." Q. The latest version or revision of the City's manual, guidelines, business rules, orders, memos or documents describing the action(s) to be taken by a City or sheriff employee or agent whose job it is to review violations and approve or disapprove the issuance of a ticket, when he or she observes a clear gender and/or age mismatch between the red light camera photo of the violating driver and the DMV file photo of the registered owner of the vehicle and is not able to identify the violating driver with a sufficient degree of certainty. "There is nothing written down to address the issue raised above. If there are discrepancies with identifying a driver or a vehicle that is not to the satisfaction of the reviewing police officer, the citation is rejected. Officers are not going to waste their time and reputation with the Court by approving citations that are clearly not conclusive and could be successfully argued in Court."